Modifications of texture and surface properties of a commercial activated carbon (Norit GF-40) were performed by several treatments in order to study their effects on the selective adsorption of nitromethane from nitromethane/water vapor mixtures. Characterisation of the samples by nitrogen adsorption and thermal analysis showed that HNO3 treatments produce important losses of porosity and surface area, accompanied of an increase of oxygenated functional groups on the surface of carbon, which are progressively removed by heating at temperatures between 573 and 1073 K. All this leads to a drastic decrease of the adsorption capacity per gram of adsorbent with respect to the raw carbon, which offers, on the other hand, the best adsorptive performance. Oxidation by H2O2 does not practically affect its textural properties and introduces an important amount of oxygen functional groups at the surface, but changes in the adsorptive properties of carbon are insignificant. Sample oxidised by H2O2 and subsequently treated by diethylentriamine shows a decrease in adsorption capacity, without any relevant loss of surface area. The raw carbon treated at high temperature that exhibits the highest surface area and where surface functional groups are absent, showed the greatest adsorption capacity for nitromethane, being much more selective for nitromethane than for water, in nitromethane-water mixtures. 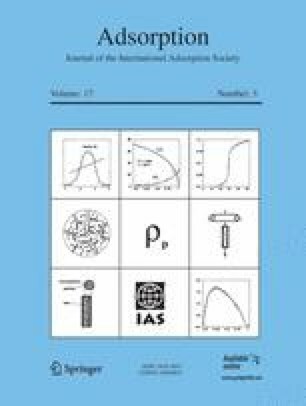 Adsorption capacity values for nitromethane on the different samples are related to the extent of the surface area, while water vapour adsorption seems to depend on the population of functional groups at the surface, which may work as adsorption sites.